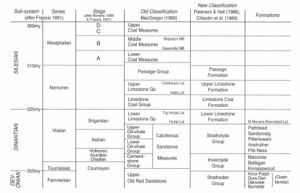 Table 4 Correlation table for the Carboniferous of Fife. Table 5 Carboniferous rocks of Fife. 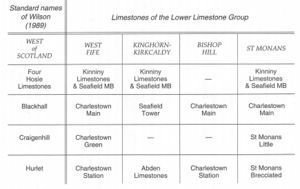 Table 6 Limestones of the Lower Limestone Group in Fife and their correlation. Outcrops of rocks belonging to the Carboniferous System lie mainly south-east of a line extending from Guard-bridge, at the mouth of the River Eden, to the south side of Loch Leven, except for the Lomond Hills mass, which projects to the north-west, and small faulted outliers occurring near Errol, Newburgh and Bridge of Earn (see (Map 2)). Within this area all the major units of the Carboniferous System are represented. The outcrop distribution is partly controlled by two large complementary structures trending N–S: (1) the Leven Syncline in which the Upper Carboniferous is preserved and which continues across the Firth of Forth to join the Lothian Syncline, and (2) the Burntisland Anticline in which Lower Carboniferous rocks are exposed. The Carboniferous rocks are subdivided as shown in (Table 4). They are described in ascending order from bottom to top, volcanic rocks being included in their correct stratigraphical position. Rocks of this age are present (1) at Fife Ness and Kingsbarns (2) in Stratheden and at Loch Leven and (3) in the Carse of Gowrie. At Fife Ness and Kingsbarns (Excursion 11) the Balcomie Beds consist of yellow and reddish sandstones with green and purple marls and rare purple conglomerates with andesite pebbles up to 2 cm long in a muddy matrix. Calcrete soils are developed. No fossils have been found in these rocks but they resemble the Inverclyde Group Downie's Loup Sandstone of the Stirling district (Browne 1980a). The andesite pebbles imply not too distant erosion of Lower Old Red Sandstone lavas at the time of deposition. In Stratheden and around the Lomond Hills the Kinnesswood Formation also includes calcrete soil profiles in a sequence of pebbly, fluviatile sandstones. Although absent from Bishop Hill (Excursion 17) Ballagan Formation cementstones and clays are present at Kingskettle (130 m: Browne 1980a, p. 325), Benarty and Navitie. In the Carse of Gowrie the Kinnesswood Formation (33 m: Browne 1980b, p. 4) is known mainly from boreholes. There too it comprises reddish and yellow sandstones with calcrete soils and mudstones. The Ballagan Formation (240 m+) comprises mudstones with cementstones and some sandstones. Salt pseudomorphs, desiccation cracks and a restricted fauna point to lagoonal conditions of formation while plant spores confirm a Tournaisian age for the rocks. In the Burntisland area the oldest Strathclyde Group rocks belong to the upper part of the Calders Member of the West Lothian Oil–Shale Formation just below the horizon of the Pumpherston Shell Bed (see (Table 5)), a marine horizon carrying the goniatite Beyrichoceratoides. One hundred metres above it the Burdiehouse Limestone, a fresh-water limestone 6 m thick, marks the base of the Hopetoun Member. Forty-six metres above the limestone is the 2 m-thick Dunnet Oil Shale, worked a century ago and the only noteworthy representative of the thick oil shales of the Lothians to occur in the area. The upper part of the Hopetoun Member is replaced by 430 m+ of volcanic rocks, mainly basalts with some tuffs (Francis 1991b, p. 399). A number of vents in the vicinity of Burntisland are the most likely source of these lavas. The Burntisland succession can be correlated with the much thicker Lothian succession to the south-west by means of the Pumpherston Shell Bed, the Burdiehouse Limestone and the Dunnet Oil Shale and it seems that the Burntisland district lay near the eastern edge of a large basin of lacustrine sedimentation in which the oil shales were laid down (George 1958). The Pumpherston Shell Bed, equivalent to the Macgregor Marine Bands (Wilson 1974), is the only horizon which allows correlation of the West Lothian Oil–Shale Formation sequence with the Strathclyde Group rocks of East Fife, palaeontological zonation with spores still being incomplete. The Strathclyde Group attains its greatest thickness in East Fife in the Anstruther Anticline where the succession is over 2000 m thick without reaching the Inverclyde Group believed to lie beneath (Browne 1980a, p. 326). The rock types in order of abundance are (1) sandstones, often with ripple marking and cross bedding; (2) clays and shales often with nodules of clayband ironstone; (3) seatearths (fossil soils), though rarely with coal over them, those that do occur usually being very thin; (4) limestones, which are very rare and seldom more than 30 cm thick. A cyclic repetition of these rock types is characteristic (Francis 1991a, p. 347) and much research has been devoted to a study of this, e.g. Fielding et al. (1988). Some of the limestones, which are usually dolomitised, and a few of the shales are marine and may carry crinoid ossicles, gastropods, the brachiopods Lingula, Productus, Schizophoria, and Rhynchonella (Camarotoechia)and the bivalves Naiadites and Schizodus. The St Monans White Limestone yielding the corals Lithostrotion and Dibunophyllum is unique in the area. These marine horizons are generally impersistent and only the Pittenweem Marine Band, equivalent to the Macgregor Marine Bands of East Lothian (Wilson 1974) (Excursion 9, Excursion 10 ) has been detected over any considerable part of the district. The non-marine shales yield bivalves and ostracods and usually finely comminuted plant debris, while the sandstones commonly contain Stigmaria (roots) and stems of Lepidodendron. The formations of the Strathclyde Group, defined on their lithology, have been traced over East Fife by Forsyth and Chisholm (1977, Fig. 2, p. 12) and there is much detailed information in their memoir. The Fife Ness Beds (230 m+), the lowest formation of the Strathclyde Group, are predominantly thick white sandstones with interbedded grey and sometimes red mudstones. Marine horizons are unknown but both algal and ostracod-bearing carbonates occur. The Anstruther to Pathhead, St Monans, coast section exposes some 1600 m of Strathclyde Group rocks, extending through the four higher formations. Taken with the succession in the Anstruther Bore (300 m: Forsyth and Chisholm 1977, p. 22) the Anstruther Beds are 800 m+ thick and are conspicuously cyclic with thin dolomitic carbonates, some of which are marine, passing up into shales, siltstones and sandstones with some seatearths and thin coals. These beds are well displayed at Randerston (Excursion 11). The Pittenweem Beds (200 m+), though less clearly cyclic, also comprise shales, siltstones and sandstones. Dolomites are rare but the shales or mudstones not infrequently include ironstones. Among the marine beds the Pittenweem Marine Band (6 m), correlated with the Macgregor Marine Bands in East Lothian and the Pumpherston Shell Bed at Burntisland, contains crinoid ossicles and a marine brachiopod fauna. Between Pittenweem Harbour and Swimming Pool typical Sandy Craig Beds (550 m+) consist of both grey and red shales between thick sandstones, some of which are very coarse grained. Only one marine band is known and the red mud-stones include concretionary carbonates (calcrete soils) some of which have been reworked, e.g. that exposed at Pittenweem Swimming Pool. The Pathhead Beds (311 m), the highest formation of the Strathclyde Group, crop out on the coast westwards from Pittenweem Swimming Pool to Pathhead (Excursion 12). They consist of cyclic sediments which show not only increasingly marine horizons towards the top, e.g. the Ardross and St Monans White Limestones, but also thin coals and seatearths, for example those beneath the Ardross Limestones. It appears that the 2000 m+ thick succession of the Anstruther area has thinned to about 490 m at St Andrews, i.e. northwards. Furthermore, when the succession is traced south-westwards from there it diminishes to 90 m at Cults, south-west of Cupar, and to only 30 m on Bishop Hill overlooking Loch Leven. It is believed that the Burntisland Anticline towards which this thinning takes place was not so much an area of uplift, but rather one of much less subsidence than the ground on either side during Strathclyde Group times; indeed spores suggest that only the very highest Strathclyde Group beds are present there (Browne 1980a, p. 324). Further west in a thin Strathclyde Group succession in the Cleish Hills minor volcanics are the 'feather edge' of the Clyde Plateau Volcanic Formation. The nature of the sediments points to their deposition under humid, tropical, deltaic, fluviatile, swamp and occasionally marine conditions with forests being killed off repeatedly by subsidence and drowning (Belt 1975). Channel switching within the delta, against a background of general subsidence, and fluctuations in sea level, are also believed to play a part in the formation of the cyclic sediments of the Carboniferous. Flooding and truly marine conditions were rare and short lived, e.g. some of the Randerston Limestones, the Pittenweem Marine Band, the Ardross Limestones and the St Monans White Limestone. In the west only the Pumpherston Shell Bed is marine and this suggests that open sea lay to the east at this time (Greensmith 1965, p. 241). Sediments belonging to this formation overlie the Strathclyde Group and are exposed on the coast at St Monans and Elie in the east and Kinghorn in the west. Inland many quarries have been opened up in the limestones, but few are now worked. Good exposures can still be seen at Cults, south-west of Cupar, on Bishop Hill (Excursion 17), the East Lomond (Excursion 16), at Charlestown and at Roscobie, 5 km north of Dunfermline. Structurally the group outcrops on either side of the Burntisland Anticline and round the southward plunging Leven Syncline. Lithologically there is a marked similarity between the cyclic sediments of this formation and those of the Strathclyde Group in East Fife, particularly the highest Pathhead Beds. However, more of the Lower Limestone Formation comprises marine shales and limestones and the latter are thicker and more persistent such that they are used for correlation over much larger areas (Wilson 1989). It is customary to take the lowest of the limestones as equivalent to the Hurlet Limestone of the west of Scotland. The correlation of this and other limestones higher in the group is set out in (Table 6). The Kinghorn succession is about 146 m thick and roughly half of it is marine. Twenty-four metres of lavas and tuff overlie the First Abden Limestone, but do not occur anywhere else in the area at this horizon. Westwards the group thickens to 190 m around Dunfermline, on the west side of the Burntisland Anticline, due mainly to an increase in the thickness of the shales. To the east in the St Monans Syncline the sequence, completely exposed except for the top few metres, is 180 m thick. The area underwent subsidence with intermittent flooding by the sea such that clear-water marine limestone formed. On each occasion the area was then silted up with marine clays followed by non-marine clays which gave way in turn to bedded and then cross-bedded sandstones as deltaic conditions spread across the area. These sandstones are frequently covered by seatearths (fossil soils) and coal seams indicating that forests grew on top of the deltas. Gentle subsidence during the period of forest growth was followed by more rapid tectonic subsidence (Fielding et al. 1988, p. 252) and a fresh invasion of the sea, giving rise to marine clays and then clear-water marine limestone once more. This formation has been of great economic importance in the area since it contains the lower set of workable coals of the Fife coalfields. Formerly extensively worked in the Cowdenbeath and Lochgelly areas, old workings are also to be found around Kirkcaldy and Dunfermline and to a lesser extent at Elie, St Monans, Colinsburgh, Largoward, Denhead and Ceres. Structural complexities and the presence of numerous igneous intrusions were responsible for the closing down of pits in most of the small fields. The very large number of workings has produced a great deal of information about the Limestone Coal Formation, but surface exposures are scattered and no good section is available for study in the area under review. The formation is delimited by the Upper Kinniny Limestone at the base and by the Index Limestone at the top. Only two widespread marine horizons occur between these in Fife. The lower, the Johnstone Shell Bed (see (Table 5)) is well known and carries Lingula; the other, the Black Metals, is rarely seen. The greater part of the succession is made up of thin-bedded micaceous sandstones and cross-bedded sandstones, with smaller thicknesses of siltstones, shales and clays with clayband ironstones. Seatearths and up to 17 workable coals account for an even smaller part of the succession. During the 19th century ironstones were worked around Cowdenbeath and Lochgelly and to a lesser extent elsewhere in Fife including Denhead, near St Andrews. The total thickness of the formation varies considerably at different localities with the line of the Burntisland Anticline again clearly one of minimum subsidence. Except in the Saline district volcanic activity was very minor during the period, giving rise to only a few metres of tuffs. These were similar to those of the Lower Limestone Formation, but forested deltaic swamp conditions predominated and led to the prolonged accumulation of peats, now seen as thick coals. Subsidence varied over the area, but only twice were marine conditions introduced and even these prevailed only for brief periods. The formation crops out in two main areas, unfortunately largely obscured by drift. The first of these, the Cowdenbeath Syncline, lies on the west side of the Burntisland Anticline. From there a narrow outcrop extends north-eastwards to Westfield, before crossing the Burntisland Anticline and turning south to the coast at the north-east end of Kirkcaldy. Until the 1950s it was well exposed there, but dumping from the pits on the adjacent coast to the north-east had almost entirely obscured the section by 1962. The second area of outcrop is north and north-west of Lundin Links, but exposure is poor and most of the information has been obtained from bore-holes. 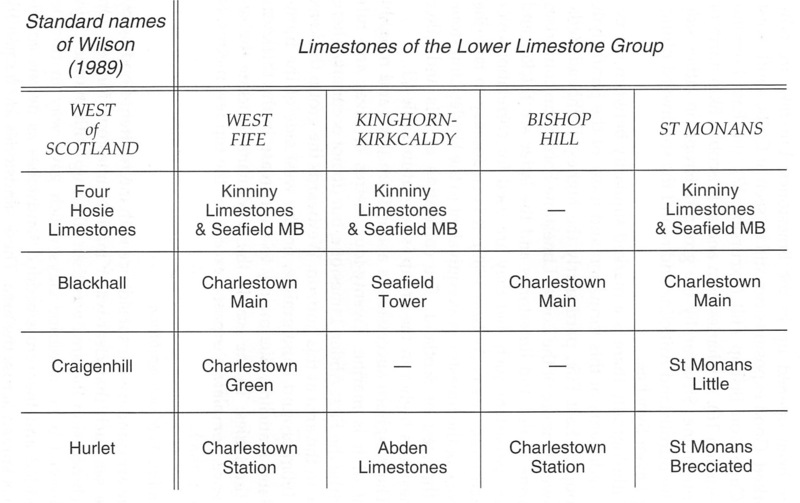 The Index Limestone (see (Table 4)) is represented in Central Fife by a marine shale. Similarly the next two limestones of the standard succession of the west of Scotland, the Lyoncross and Orchard Limestones, are represented in central Fife by calcareous marine shales named respectively the Lochore and Capeldrae Marine Bands. Only on reaching the metre-thick Calmy Limestone can a lithological correlation be made between Fife and the west. The Plean Limestones of the Scottish Central Coalfield are also represented in Fife by calcareous shales. The Castlecary Limestone at the top of the formation, and still exposed on the coast north-east of Kirkcaldy, is about 2 m thick in Central Fife and is associated with calcareous shales. There are many fireclays or seatearths, but only a small number of coal seams. However among these the Hirst Coal in West Fife and Clackmannanshire beyond is being extensively worked for the huge Longannet coal-fired power station. 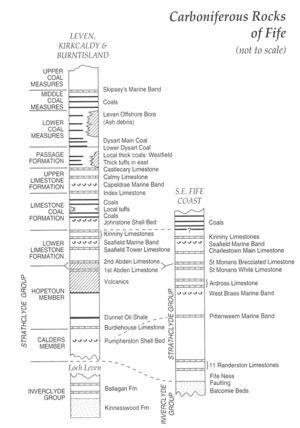 The sediments are similar to those of the Limestone Coal Formation, the main difference in Fife being a small increase in the proportion of marine beds. Contemporary volcanic activity was considerable in the area north of Leven and it is believed that much of the tuff there came from vents in the vicinity of Largo Law (Forsyth and Chisholm 1977, p. 105). At Westfield there are both tuffs and five basalt flows of this age. The same type of cyclical sedimentation as was seen in the Lower Limestone Formation occurs in the Upper Limestone Formation, the main difference being that clear-water limestone formation but rarely took place. As a result the fauna of the marine beds is usually impoverished. Rocks belonging to this formation crop out in two areas, a small one at Westfield in the north-east-trending Cowdenbeath Syncline and terminating against the Ochil Fault, and a much larger one bounding the Leven Syncline on its north and west sides. This larger outcrop runs northwards from the coast near Kirkcaldy, and then north-eastwards for some distance towards Largo Law, with a branch occupying the centre of the Earl's Seat Anticline. As with the previous groups the Passage Formation is quite thin – 137 m – adjacent to the Burntisland Anticline, whereas to the east it is over 270 m thick. In the area north-east of Kirkcaldy and in the Earl's Seat Anticline the bulk of the succession comprises pale-grey or white cross-bedded sandstones and grits with subordinate seatearths and shales, often red or purplish in colour. Marine horizons are rare and limestones absent. The base of the succession is drawn at the Castlecary Limestone and its top is arbitrarily drawn at the base of the Lower Dysart Coal. On the coast between Kirkcaldy and Dysart there are substantial exposures of sandstones, often very coarse grained, but virtually nothing else. Palaeontologically the top boundary lies well below the Lower Dysart Coal (Francis 1991a, p. 376). When this standard succession is traced eastwards, first a single basalt lava flow appears 3 km north of Leven and then as Largo Law is approached most of the top half of the group is replaced by tuffs from that vent. A major change in the succession also takes place westwards. Not only does the formation thin to about half the previous thickness, but in the Westfield Basin coal seams account for 60 m of the 150 m of strata present (Francis 1991a, p. 364). These coals were apparently very restricted in distribution, occurring only at Westfield where they were worked opencast for some twenty years, yielding some 21 million tonnes of coal. Deltaic conditions again prevailed, together with fluviatile, with few marine invasions. The cross-bedded sandstones and grits often show slumped foreset beds and frequent seatearths, and the thick coals at Westfield indicate that forests were repeatedly established on the delta, sometimes for prolonged periods. Thickness variations are again due to differential subsidence. The outcrop of these rocks is restricted to a south-eastward-dipping faulted strip extending along the coast from Dysart to Leven, a synclinal strip extending 8 km northwards from Dysart and, formerly, a small downfaulted area at Westfield, now virtually removed by opencast mining. At one time almost the whole succession was exposed between Dysart and Leven but dumping from pits on the coast in the 1960s largely obscured this. The succession thins north-eastwards from nearly 800 m at Dysart to 580 m at Leven (Knox 1954) and this thinning is known, on the basis of much detailed knowledge from mining, to affect both individual coal seams and the strata between. 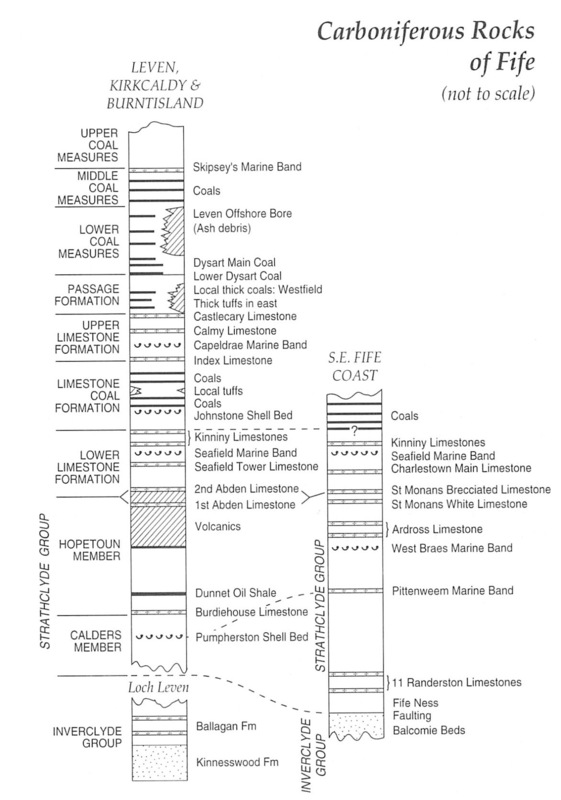 Skipsey's Marine Band separates the Middle from the Upper Coal Measures and the Queenslie Marine Band separates the Lower from the Middle Coal Measures. Apart from these two marine bands and rare local Lingula bands the strata are entirely non-marine, and zonation and correlation are therefore based on the distribution of fresh-water bivalves, or 'mussels' as they are usually called, or on plant spores. Both groups of fossils have been used to establish detailed zonal schemes in the Westphalian and both show that the base of the Westphalian lies some distance below the convenient base of the Coal Measures drawn in Fife at the bottom of the Lower Dysart Coal (Francis 1991a, pp. 365 and 376), the lowest workable seam. In the Lower and Middle Coal Measures a maximum of twenty coal seams have been worked, the number falling off to the north-east. Many of the seams have partings of shale or fireclay and a few have partings of cannel coal or ironstone. The beds between the coals include white and buff sandstones, often cross-bedded, and dark grey shales with plant remains and occasional sandy partings. Mussel bands are usually found in the roofs of coal seams, but may occur in the shales as well. This type of succession shows little lateral variation except in thickness and extends as high as Skipsey's Marine Band which contains Lingula, the nautiloid Metacoceras, the goniatite Anthracoceras and fish remains, all of which were at one time collected on the shore at Wemyss Castle. The Upper (Barren Red) Coal Measures make up the rest of the succession. The strata consist of sandstones and grits, shales, clays and marls, almost all with a red or purple colour indicating a semi-arid climate. Occasional thin beds of probably fresh-water limestone are present together with a few thin coals. Plant fossils have been recorded as well as Spirorbis, fish remains and Crustacea (Binney and Kirkby 1882), but fossiliferous exposures are not now known. The beds attain a maximum thickness of 300 m without the top being seen. Only a single tuff band one metre thick, lying above the Lower Dysart Coal, has been seen at outcrop in the whole of the Coal Measures. It is all the more surprising, therefore, to find that in the offshore bore at Leven, after penetrating the Upper and Middle Coal Measures and the upper part of the Lower Coal Measures, the bore passed through an 8 m basalt flow followed by 150 m of 'volcanic detritus' in which tuffs, volcaniclastic sediment and even thin coals occur and in which the bore terminated (Ewing and Francis 1960). The bore log suggests that a volcanic centre in this vicinity was undergoing erosion and renewal at this time. The Lundin Links Neck cuts Middle Coal Measures sediments and the Viewforth Neck, Lower Largo, has in it collapsed tuffs containing Lower Coal Measures spores (Forsyth and Chisholm 1977, pp. 180–3). The effects of earth movements during and near the end of the Carboniferous Period can be clearly seen in Fife, but further north they are much more difficult to assess owing to the scarcity of post-Middle Devonian sediments. The movements can be divided into two categories, those contemporary with Carboniferous sedimentation and those that are dearly later. This variation across the anticline affected not only individual beds but also whole groups of beds. A basement control has been invoked by Francis (1991a, p. 376). A similar but apparently unrelated variation across the Earl's Seat Anticline is confined to the Lower and Middle Coal Measures, this anticline having had no apparent effect on sedimentation prior to this time. Synsedimentary movements on faults have been demonstrated on for example the Ochil Fault at Westfield (Brand et al. 1980, p. 6) while a close relationship between the Ardross Fault and volcanic activity has been deduced by Francis and Hopgood (1970). (ii) The late-Carboniferous, or Hercynian, earth movements gave rise to several folds of considerable amplitude, to many minor folds and to widespread faulting, locally with large displacements. From west to east the major folds in Fife attributed to the late-Carboniferous movements are: (1) the accentuation of the Burntisland Anticline and the complementary syncline to the west between Cowdenbeath and Westfield; (2) the main N–S trending Leven Syncline which extends across the Forth to the Lothian Syncline near Edinburgh and containing the Coal Measures, but subdivided by subsidiary anticlines at Earl's Seat and Leven; (3) a large and irregular syncline extending to the north and north-east from Largo almost to St Andrews; (4) the St Monans Syncline and the Anstruther Anticline. A host of minor folds can be seen wherever exposure permits, e.g. those along the Kinkell Braes east of St Andrews (Excursion 9, Excursion 10). Evidence for the existence of numerous small folds and some not so small can also be obtained from mining data, e.g. in the Ceres Coalfield in which the strata reach a vertical position. North of the Carboniferous outcrop the folding was apparently much less severe, the Upper Old Red Sandstone along Stratheden being almost horizontal except in the vicinity of faults (Excursion 8). To the south of Loch Leven the largest fault in the area, in common with many minor ones, strikes east–west and is a continuation of the great Ochil Fault of the Stirling area. Its southerly downthrow is at least 750 m, much of it post-Coal Measures, although some of these faults are now known to have been active by Namurian times (Francis and Walker 1987). Eastwards the fault splits up, but the individual branches are still important at Leven and Durie. Large numbers of parallel faults are known from mining around Dunfermline, Cowdenbeath and Glenrothes (e.g. Francis 1961, p. 35). Post-Dinantian faulting was responsible for the preservation of the Carboniferous rocks at Bridge of Earn, Newburgh and Errol (Armstrong et al. 1985, pp. 62–4) and, by inference, outliers of Upper Old Red Sandstone elsewhere in Angus and Kincardineshire. In the area covered by the guide there are perhaps seventy sills, many of which form parts of the major quartz-dolerite Midland Valley Sill (Francis 1991b, p. 407), about a dozen major dykes and about a hundred volcanic vents. Some at least of the distribution is clearly related to basement structure, e.g. the vents along the Ardross Fault and others adjacent to lines of reduced subsidence in the Carboniferous (Francis 1991b, p. 410). It was clearly an area of very considerable igneous activity and the products can be divided into three categories. A suite of alkali-dolerite sills in the Namurian rocks of Fife; these are believed by Francis and Walker (1987) to be a little younger than the sediments in which they lie, sediments which at the time of emplacement must have been almost unconsolidated and still water saturated and thus of low density compared with the dolerite magma. Spatially and petrochemically they are closely related to volcanic necks which Francis and Walker believe were the feeders for the sills. They are composed variously of basic plagioclase feldspar, clinopyroxene, olivine, analcite and amphibole.
) comprise sills and E–W dykes and are composed of basic plagioclase feldspar and pyroxenes with interstitial quartz and micropegmatite. Pyrite is a common accessory mineral and hypersthene has also been recorded. Where the interstitial material appears to be devitrified glass the rocks are described as tholeiites (Excursion 3). Age dating at 296 My suggests a very late Carboniferous (Stephanian) age for these (Francis 1991b, p. 407). The sills appear to have been fed by E–W dykes. From these the magma seems to have spread out as sills down-dip into adjacent thick sedimentary basins (Francis 1982). The E–W quartz-dolerite and tholeiite dykes of North Fife, Perthshire, Angus and Kincardineshire are grouped with those of the rest of the Midland Valley on the basis of similarity of trend and the uniformity of composition (Francis 1991a, p. 380). Of the one hundred or so volcanic vents in East Fife a number have within them basanite intrusions. Age dating on a number of these, e.g. Elie Ness (Forsyth and Rundle, 1978), points to around 289±10 My as the likely age, thus suggesting a late phase of post-quartz-dolerite igneous activity. Unlike Ayrshire there is no evidence of sill emplacement of this early Permian age. Considering the nature of these vents two points are clear: (1) where the magma carried xenoliths of ultrabasic rocks from the mantle it must have come from considerable depths, and (2) evidence of any volcanic edifice still in place is lacking, but is perhaps hardly to be expected (Francis 1983, p. 175). In most vents the present level of exposure is many hundreds of metres below what was the surface at the time of eruption (Forsyth and Chisholm 1977, p. 175), e.g. Excursion 13. It is evident that neck drilling from below has been brought about by gas fluxion breaking down the country rock to produce both a breccia of country rock fragments, e.g. sandstone and shale (Excursion 10, Excursion 15), and a finer-grained equivalent, tuffisite, which invades the wall rock as thin dykes and stringers. Similar material fills the space between the larger clasts within the vents. Extensive wall-rock stoping and, later, collapse into the vent took place during each pulse of activity, the site marked by inward dipping concentric fractures and steep concentric dips in the bedded tuffs (Excursion 10, Excursion 15). In many vents a progressive increase in content of igneous material inwards from the vent margin can be seen with the appearance in the tuffs of shreds of then fluid but now highly altered and whitened basalt, or fragments of already solidified basalt ranging from columnar-jointed blocks down to the finest dust. Agglomerates and tuffs, greenish in colour and comprising predominantly igneous material, contrast with others, almost entirely composed of sediment, which have a grey hue. Mixtures are not uncommon. Centroclinally dipping bedded tuff is common in the larger vents, e.g. Kincraig (Excursion 15) or the Rock and Spindle (Excursion 10), and in these volcanic bombs and cross-bedded base surge deposits have been identified. There is no doubt that originally subaerially exposed tuffs, even with fossil wood fragments, have been carried progressively hundreds of metres down the pipes of many of the vents in what must have been long series of pulses of eruption, collapse and quiescence. Intrusion and possibly occasional extrusion of basaltic and related magma produced later plugs, dykes and perhaps flows within the vents. Some of these are packed with xenoliths (e.g. Excursion 10) and some extend outwith the vents for some distance, e.g. the Chapel Ness Sill adjacent to the Craigforth Neck at Elie (Francis and Walker 1987, p. 321). Vent activity ended at any stage in the sequence and could be renewed many times with different centres of activity occupied in succession, e.g. at Kincraig (Excursion 15). Vent eruption of lavas and tuffs from Strathclyde Group to Coal Measures. Alkali-dolerite sills, some cut by late vents, Limestone Coal Formation to Passage Formation. Main folding and faulting post-Coal Measures. ARMSTRONG, M., PATERSON, I. B. and BROWNE, M. A. E., 1985. Geology of the Perth and Dundee district. Mem. Br. Geol. Surv. Sheets 48W, 48E, 49. BELT, E. S., 1975. Scottish Carboniferous cyclothem patterns and their paleoenvironmental significance. In Broussard, M.L.S. (ed.) Deltas, models for exploration. Houston Geol. Soc., Texas, 427–49. BINNEY, E. W. and KIRKBY, J. W., 1882. On the upper beds of the Fifeshire Coal Measures. Quart. Jour. Geol. Soc. Lond. 38,245–56. BRAND, P. J., ARMSTRONG, M. and WILSON, R. B., 1980. The Carboniferous strata at the Westfield opencast site, Fife, Scotland. Rep. Inst. Geol. Sci. 79/11. BROWNE, M. A. E., 1980a. Stratigraphy of the Lower Calciferous Sandstone Measures in Fife. Scot. Jour. Geol., 16, 321–8. BROWNE, M. A. E., 1980b., The Upper Devonian and Lower Carboniferous (Dinantian) of the Firth of Tay, Scotland. Rep. Inst. Geol. Sci. 80/9. BROWNE, M. A. E., 1986. 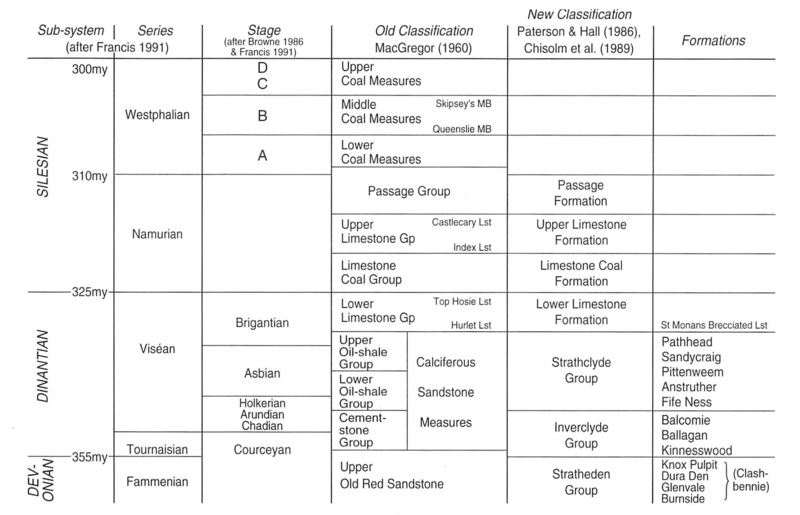 The Classification of the Lower Carboniferous in Fife and Lothian. Scot. Jour. Geol., 22, 422–5. EWING, C. J. C. and FRANCIS, E. H., 1960. No. 3 off-shore boring in the Firth of Forth (1956–57). Bull. Geol. Surv. Gt. Br., 16, 48–68. FIELDING, C. R., AL-RUBAII, M. and WALTON, E. K., 1988. Deltaic sedimentation in an unstable tectonic environment – the Lower Limestone Group (Lower Carboniferous) of East Fife, Scotland. Geol. Mag., 125, 241–55. FORSYTH, I. H. and CHISHOLM, J. I., 1977. The geology of East Fife. Mem. Geol. Surv. U.K.
FORSYTH, I. H. and RUNDLE, C. C., 1978. The age of the volcanic and hypabyssal rocks of East Fife. Bull. Geol. Surv. Gt. Br., 60, 23–9. FRANCIS, E. H., 1961. Economic geology of the Fife coalfields, Area II (2nd Ed.). Mem. Geol. Surv. Scotland. FRANCIS, E. H., 1982. Magma and sediment – I. Emplacement mechanism of late Carboniferous tholeiite sills in northern Britain. Jour. Geol. Soc. Lond., 139, 1–20. FRANCIS, E. H., 1991a. Carboniferous. In Craig, G.Y. (ed.) Geology of Scotland (3rd Ed. ), Geol. Soc. Lond., 347–92. FRANCIS, E. H., 1991b. Carboniferous–Permian igneous rocks. In Craig, GY. (ed.) Geology of Scotland (3rd Ed. ), Geol. Soc. Lond., 393–420. FRANCIS, E. H., and HOPGOOD, A. M., 1970. Volcanism and the Ardross Fault, Fife. Scot. J. Geol. 6, 162–85. FRANCIS, E. H., and WALKER, B. H., 1987. Emplacement of alkali-dolerite sills relative to extrusive volcanism and sedimentary basins in the Carboniferous of Fife, Scotland. Trans. Roy. Soc. Edinb. : Earth Sci., 77,309–23. GEORGE, T. N., 1958. Lower Carboniferous palaeogeography of the British Isles. Proc. Yorks. Geol. Soc., 31, 227–317. GREENSMITH, J. T., 1965. Calciferous Sandstone Series sedimentation at the eastern end of the Midland Valley of Scotland. Jour. Sedim. Petrol., 35, 223–42. KNOX, J., 1954. 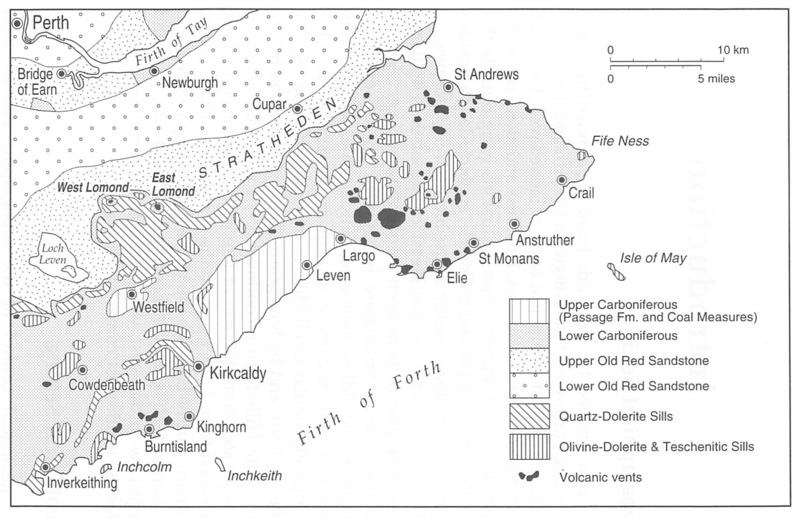 Economic Geology of the Fife coalfields, Area III. Mem. Geol. Surv. U.K.
MACGREGOR, A. G., 1960. Divisions of the Carboniferous on Geological Survey Scottish Maps. Bull. Geol. Surv. Gt. Br. 16, 127–30. PATERSON, I. B. and HALL, I. H. S., 1986. Lithostratigraphy of the late Devonian and early Carboniferous rocks in the Midland Valley of Scotland. Rep. Br. Geol. Surv., 18, No.3. WILSON, R. B., 1974. A Study of the Dinantian marine faunas of south-east Scotland. Bull. Geol. Surv. Gt. Br., 46, 35–65. WILSON, R. B., 1989. A study of the Dinantian marine macrofossils of central Scotland. Trans. Roy. Soc. Edinb. : Earth Sci., 80, 91–126. This page was last modified on 23 February 2019, at 18:01.